When the company responsible for upgrading the voice alarm systems (VA) of three London Underground lines decided to look at more time and cost efficient ways to complete their assignment, LSBU was a logical choice as the knowledge base partner. The upgrade of 73 stations VA systems (about 25,000 loudspeakers) involved extensive acoustic survey, design, installation and onsite testing under challenging logistical and time restricted late night conditions. The general attitude towards the quality of speech announcements in the underground has traditionally been of acceptance of substandard performance. We started the project with a passionate focus to improve that performance and raise awareness on the critical importance of underground voice alarm systems. The underground project cost £200,000 and was run as a three and a half year Knowledge Transfer Programme (KTP). This KTP was one of well over 100 such partnerships the University has been involved with to date. It was set up in 2007 between former LSBU MSc student Luis Gomez-Agustina, academics from the university's Division of Civil and Building Services Engineering and the communications company telent. 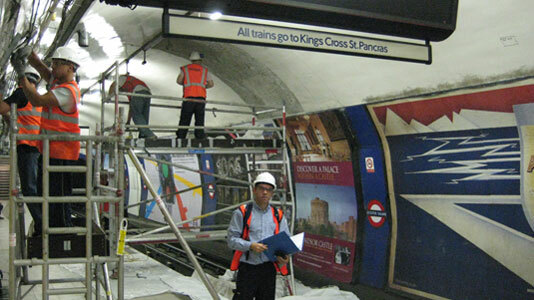 The project, led by Luis as KTP Associate, and supervised by Dr Steve Dance, aimed at investigating new measurement, design and prediction techniques which could improve the clarity of announcements and reduce valuable test time needed on site. A dedicated computer-based model, a tailor made measurement procedure developed during the project and the employment of sophisticated acoustic measurement techniques resulted in significant VA performance improvement. These outputs enabled the project to be completed ahead of time and under budget, a success that was recognised with the project being award an 'A grade' by the KTP organisation. The process of designing and implementing satisfactory VA systems for underground station is complex and depends on multiple inter-related factors, station design and operational constraints. The project aimed to come up with a design template which would avoid unnecessary and costly design repetition design work. One of the biggest challenges was logistical: the team was only allowed to access stations between 1.30am and 4.30am, and all the work had to be carried out without using cables, ladders or scaffolding. The design team carried out 25-second test runs at many stations at night, using the readings from these to help design a template and create computer models of the stations. Constant liaison and excellent communication with other trades working in the station design became essential in order to manage and minimise the impact of many conflicting objectives... This was one of the most important non-technical challenge in the success of the project. The research which followed has provided novel guidance, recommendations and insights on the design and optimisation of VA systems to achieve higher speech clarity from announcements in underground railway stations. More importantly, in his research and publications Dr Gomez-Agustina highlights the critical importance of these life saving systems particularly in an underground railway system like the London tube. He proposes and justifies higher performance specifications and to help achieve current and proposed higher targets is promoting the creation of a new British Standard specific to the design, test and installation of VA systems on underground railway stations. Existing standard and guidance were designed for a sole worst case scenario, when a station is virtually empty, while the new standard will consider a variety of likely emergency situations. The well-received research undertaken so far will influence the working practices in the relevant industry for safer underground stations worldwide. This first KTP project constituted the basis for further research, allowing Dr Gomez-Agustina to complete his PhD in 2012. His doctoral thesis received the 2013 Institute of Acoustics Peter Barnett Memorial Student Award. Read more about current research being undertaken by Dr Gomez-Agustina and other academics in the field of Acoustics. This was telent's first KTP with LSBU and its success has lead to them embarking on a second project with us looking at developing, testing and implementing new design rules to optimise the use of CCTV cameras on London Underground platforms.